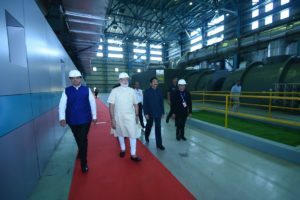 Prime Minister Narendra Modi on Friday inaugurated various units of thermal power plants at Koradi, Chandrapur and Parli, near Nagpur in Maharashtra, with a total capacity of 3,230 Mega Watts. The new units are expected to increase the state’s power supply to help farmers use it at flexible hours as per their requirements, reported The Economic Times. “One of the sectors towards which we are devoting significant effort is the renewable energy sector,” the Prime Minister said while describing energy sector as a great vitality in the 21st century. “Each and every Indian must have his or her own house. And that house must be equipped with electricity, water and other facilities.” PM also laid the foundation stones for the proposed Indian Institute of Technology (IIT), Indian Institute of Management (IIM) and All Indian Institute of Medical Sciences (AIIMS). Earlier in the day, the Prime Minister paid floral tributes to Dr Bhimrao Ambedkar. Maharashtra Chief Minister Chief Minister Devendra Fadnavis along with Union Minister for Road Transport, Highways and Shipping Nitin Gadkari and Minister for Human Resources Development Prakash Javadekar were also present on this occasion.